Hartlepool United boss Craig Hignett has made two changes to the side beaten by Solihull for the trip to Aldershot. In comes Irish midfielder Gavan Holohan for his first start since signing earlier this year, with Liam Noble missing out. Myles Anderson is also replaced in the back four by Mark Kitching, while Adam Bale and Danny Amos are both fit enough for a places on the bench. 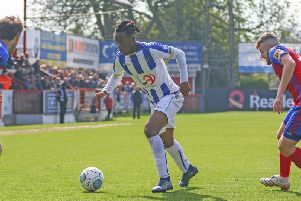 Pools XI (4-3-3): Scott Loach; Peter Kioso, Fraser Kerr, David Edgar, Mark Kitching; Nicky Featherstone, Ryan Donaldson, Gavan Holohan; Luke Molyneux, Luke James, Nicke Kabamba. Subs: Ryan Catterick, Myles Anderson, Danny Amos, Adam Bale, Niko Muir.